1. 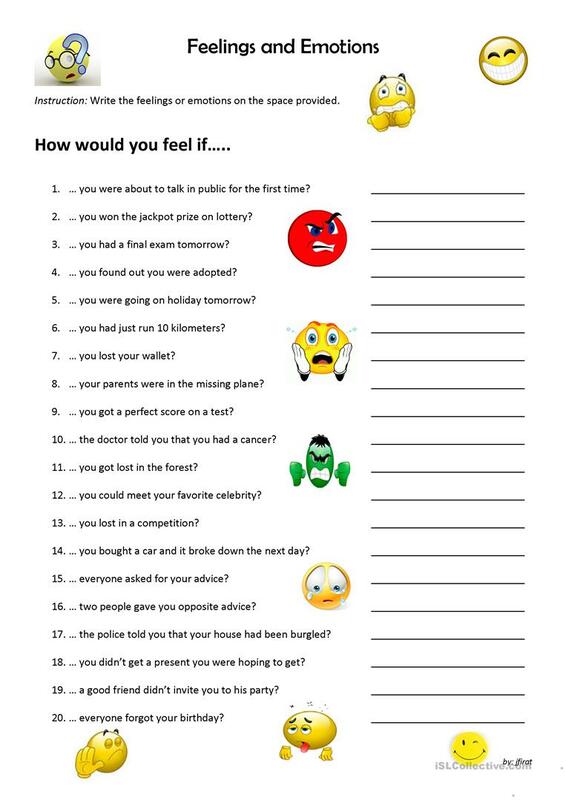 The objective of this worksheet is to test the students knowledge about feelings and emotions. The present downloadable worksheet is recommended for elementary school students, kindergartners and nursery school students and adults at Beginner (pre-A1) and Elementary (A1) level. It is great for practising Adjectives to describe feelings / mood / tone and Adjectives to describe personality and character in English, and was designed for enhancing your groups' Spelling, Speaking, Reading and Writing skills. It features the topic and words of Feelings, emotions. jfirat is from/lives in Turkey and has been a member of iSLCollective since 2014-03-07 13:45:50. jfirat last logged in on 2015-06-04 16:32:26, and has shared 1 resources on iSLCollective so far.